“Just Egypt?” The chiseled-faced, bristle-haired field security sergeant, who looked every one of his nineteen years, fixed me with an intense, cold gaze. They practice that gaze in front of mirrors, I told myself, but my palms were sweating. It was early summer, 1987, and I’d received a brown envelope requesting that I report to my reserve regiment’s field security office at a particular time on a particular day. I knew very well what it was about. The kid leaned back in his chair and the faintest of smiles played over his lips. I’m suddenly back in fifth grade, when Mark Glick and Mike Sheltzer were monitoring my brain. One of my minds is about to say to him: “Kid, this is the oldest trick in the book.” Another mind is wondering whether he’ll let me call home before casting me into a windowless dungeon. I’m lying in bed. My brother is snoring on the other side of the room. Mark Glick lives up the street. He is even smarter than me, especially in math, and is always one of the first kids called when sides are chosen for kickball in the schoolyard. I am never chosen; I am forced on one team or another, or made permanent catcher. Mike Sheltzer is Mark’s good friend, popular, personable, and good-looking (for a ten-year old). They are in Mark’s house, sitting in front of a device of their devising which enables them to communicate with me telepathically. “I’d really like to be your friend,” I tell them. The Chronicle of Higher Education had asked me to do a story on the Jordanian university system. This was a decade before a peace treaty made communication with and travel to Jordan simple. It was still an enemy country. 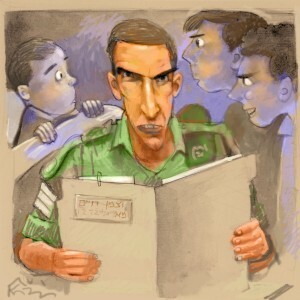 I could enter the kingdom from the Allenby Bridge with my U.S. passport, but to leave Israel I needed the army’s permission. I began setting up meetings on the other side. And I contacted my regiment’s field security office to obtain the necessary document. The security sergeant had me fill out some forms and promised that I’d hear from him soon. My family had moved from Ohio to Silver Spring, Maryland, in the summer before ninth grade. Such transitions weren’t easy for me. I did not make new friends easily. Since I was bad at sports, the other males did not seek to make alliances with me at school, and I was no fun to play catch with afterwards. I earned some grudging respect for reading lots of books—my bar on Mrs. Sacks’s reading chart was longer than that of any of the other boys. But whatever Freudian magic I might have hoped for was ruined by the fact that the only other kids with such long bars were girls. Mark and Mike, best friends, were virtually the only other boys who shared any of my interests. So they were my friends, sort of. And that was all I had. But they were friends with lots of kids. And those friends were friends with lots of kids. Lots of kids were friends with lots of kids, and I was on the outside. After about a year and a half of this, one of my minds discovered that Mark and Mike weren’t just best friends with each other. They were also best friends with me. Just that it was a secret. How did I know? Because they told me. But they couldn’t just tell me in front of anyone, because it was a secret. So they told me at night, in the dark, over the airwaves to my brain. But in phone call after phone call, the security sergeant kept putting me off. The Jordan permit was difficult, it required this officer’s approval and that officer’s signature. Finally, a week before my mid-May trip, he told me that the permit would be ready only in June, at the earliest. I already had appointments set up and the newspaper was eagerly awaiting my report. I couldn’t cross the bridge. But I could easily go to Egypt, a country we were at peace with. So I bought a ticket to Cairo, and when I got to the Cairo airport I walked over to the Royal Jordanian counter and bought myself a ticket to Amman. I concentrate toward them that are nigh. Another mind intrudes. “How do I know,” I ask Mark and Mike, “that this isn’t just my imagination?” I did not say that my imagination had cooked up much weirder things and that I was wary. “Best friends believe,” Mark says to Mike. “If you want to be our best friend, you have to believe,” Mike says to me. “Anyway, doesn’t it seem real?” Mark asks. I screwed up my courage. The sergeant looked at me in surprise. “That’s none of the army’s business,” I protested. “Why does this have to be a secret?” I ask Mike and Mark. “Why?” they asked in unanimous surprise. I can’t actually hear this, but I know that Mark is looking at Mike, and Mike at Mark. “Can we do that?” Mike asks Mark. “Only if it doesn’t give away the secret,” Mark says to Mike. “Anything else?” I asked the sergeant. He shrugged his shoulders. “Not from me.” He took out another file and began to examine it with great interest. “If you want to, you can go,” he said without looking up. The next morning the teacher got excited about Ponce de Leon and her history lesson went slightly past 10 a.m. But as soon as she was finished, at 10:07, Mark Glick got up from his desk, walked over to the window closest to me, and opened it. A warm, slightly moist breeze blew in and ruffled my shirt. Mark looked me straight in the eye, then walked slowly back to his seat. That night, Mark and Mike contacted me again. South Jerusalem Wins Moskowitz Prize!